Discussion in 'English Only' started by Tony100000, May 6, 2015. Is there any difference between these two terms? As far as I know, both mean to fasten a door, gate, etc.. In the dictionary, they only specify that a "latch" is a bar used to keep something shut. Is a "latch" some kind of a "catch"? They are different. A latch is made up of at least two pieces of metal: one mounted on the outside of the door jamb and one mounted on the door, for example. The two (or more pieces) will slide into each other or bend or snap together in such a way as to lock the door shut. You have to manually do something to it to open and shut it. A catch is some kind of mechanism that literally "catches" the door as it shuts and helps it stay shut. So it can be a magnetic strip mounted inside a cupboard that catches a metal strip on the inside of the cupboard door or a 'ball' that nestles into a small hole or any other design that automatically 'catches' the door to keep it from opening on its own or bouncing open if you bang it shut. A catch is mounted on the inside, side or bottom of the door and you don't often see it like you would see a latch. A catch works automatically; you don't have to 'work' it like a latch. If I understood well, a "catch" is that thing that comes out when you turn over a key to close the door, right? No, I believe that's the bolt, if it's a lock, and the latch if it's curved and managed by a doorknob. 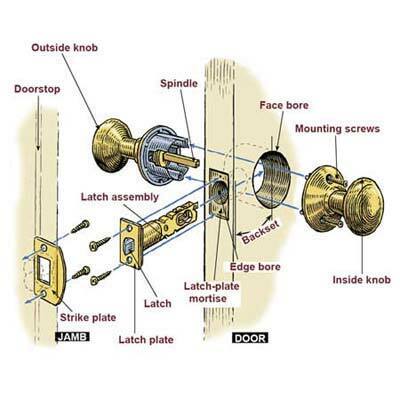 It's also called the deadbolt for locks and the latchbolt for doorknob assemblies, in some diagrams.